The Reformed Church in Hungary fulfills its mission through maintaining certain institutions that serve not only their local communities, but people nationwide. For example, the Reformed educational institutions, since their foundations, have been widely recognised both within and beyond the country's borders for their dedication to Christian values. The Bethesda Children's Hospital has been known for its philosophy, which considers up-to-date technology and the spiritual welfare of young patients vitally important. The Bethesda Children's Hospital is one of the oldest children’s hospitals in Budapest, and the only Christian children’s hospital in Central and Eastern Europe. The German Filia of the Reformed Church founded the institute 142 years ago. The Philadelphia Deaconess Mother House oversaw the facility for decades, until 1938. The Bethesda Hospital was nationalised, like other church institutions, and was used for forty years by the state. In 1992, it was transferred back to the Reformed Church in Hungary. The healing community of the hospital intends to emphasise spirituality and professional skills, as well as the importance of modern technical facilities. The hospital admits children (0-18 years) from the capitol, but also from across Hungary. The hospital cares for socially disadvantaged and physically handicapped children and their families. The hospital can provide a variety of medical care within the field of paediatrics. Neurology, pulmonology and allergology are the areas that have particular importance, because they cover the most frequently occurring modern illnesses. The Reformed Church in Hungary maintains a number of Reformed educational institutions. These schools aim to make their students well-educated, creative Hungarian citizens with a strong Christian character and respect for universal and national values. Reformed students are raised to be confessors of their own faith and faithful members of their congregations; non-Reformed students are taught to be loyal to their own denominations and to respect Reformed values. The realisation of these objectives is based on the religious heritage and pedagogical experience of the Reformed church schools accumulated through the centuries, with the aim of continuing this tradition and further developing its achievements in the future. In as early as 1990, laws were passed to make it possible for churches (and also church foundations, business organisations and private individuals) to participate in the activity of education along with state and local government institutions. The number of institutions run by churches has grown from year to year. - 4 higher education institutions (out of which the Károli Gáspár Reformed University has 4 faculties). In the public and local government schools, Reformed religious education has been in progress for many years. The Theological Academy of Budapest was established by Gábor Báthory on 10 October 1855, in the church at Kálvin Square. This institution is considered the ancestor of present day Károli Gáspár University of the RCH. Up until then, ministerial training took place in Kecskemét, but in 1855 it was transferred to Pest. On 1 July 1990, the Academy became a university. The aim and task of KRE is to follow the great traditions of Reformed colleges (Sárospatak, Pápa, Debrecen, Nagyenyed, Kolozsvár) and enable training in many fields of science besides ministerial training. The Reformed Theological Academy of Pápa (PRTA) is a ministerial training institution in the Transdanubian Reformed Church District (Dunántúl). It consists of two departments: Reformed Theology and Catechism Education. In the Department of Reformed Theology, students can choose between ministerial (12 semesters) and theological (10 semesters) majors. The Catechism Education Department functions within the confines of the University of Kaposvár and the University of West Hungary. A protestant school was established in Sárospatak in the 1530s. After this, the institution soon started to specialise in theological training. After a change of regime in 1989, the Reformed College Foundation of Sárospatak was registered to support the reborn College. The Theological Academy was reorganised, and in October 1991, after 40 years of forced hiatus, the Academy restarted its work with 49 students. Soon after, it became a state-recognised theological college. The Academy looks back on its 480-year history with pride. The Debrecen Reformed Theological University is the successor of the Debrecen Reformed College, which was founded in 1538. The University is one of the Hungarian centers for Protestant theological training with a major interest in training ministers for the Reformed Church in Hungary. In September 2011, the Ferenc Kölcsey Teacher Training College of the Reformed Church was incorporated into the University. The DRHE consists of Theological, Theological-Minister, Catechist-Minister and Catechism Teacher departments. 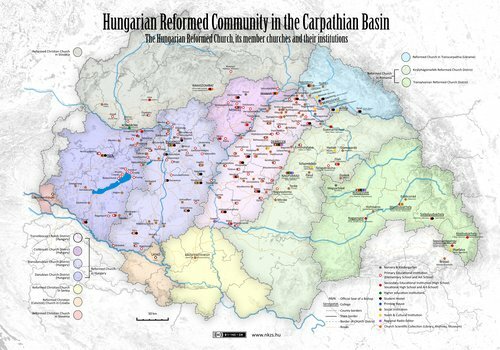 The diaconal services of the Reformed Church in Hungary are currently done in 509 fields, supporting approximately 35,000 individuals. The dedicated diaconal workers believe they have a calling in their own special fields, and they do their sacrificial work in faith that they can provide a better quality of life for groups and individuals in need. Statistics show that the demand for these services is great, but the number of institutions providing help is very small at present. We assist 28,677 elderly people, out of which 3,836 are placed in 80 nursing homes. We support 3,100 individuals in this field. • 197 children placed in fiver nurseries. • Our village and farmstead caretaker services (17) support individuals and communities in need. Address: 1092 Budapest, Ráday u. 28. Ráday Street, the location of our conference centre, is one of the main attractions of Budapest, a colourful area with numerous bars and restaurants, leading to Kálvin square, in the very heart of downtown Budapest. It is easy to reach by underground from any of the railway or bus stations. The centre is owned and managed by the Dunamellék Church District of the Reformed Church in Hungary. The same building houses the Theological Faculty of the Károli Gáspár Reformed University, the Bishop's Office, the Bible Museum and a Theological Library. The Conference Centre provided the venue for one of the CPCE (Community of Protestant Churches in Europe) General Assemblies and one Assembly of the Lausanne Conference. Address: 3233 Gyöngyös, Mátraháza Üdülőtelep 1. This entertainment and conference centre is located 80 km from Budapest. The complex is surrounded by woods and has recently been renovated. It contains accommodations for a total of 65 people, as well as a conference room suitable for 100 people. The complex is fully equipped with Wi-Fi connection, sound system, organ, kitchen and dining room. Address: 8624 Balatonszárszó, Csárda u. 39–41. Located on the southern coast of Lake Balaton, the conference centre consists of a youth hostel for 120 people and a hotel with 65 rooms. The largest conference room is suitable fora maximum of 350 people, but the centre has several smaller rooms as well. Well-equipped with laptops, scanners, a copy- and fax-machine, DVD- player and sound system, this complex is an ideal place for large conferences. Address: 5309 Berekfürdő, Berek tér 19. Located in a tranquil holiday village with good infrastructure, Berekfürdő is ideal for professional conferences. The centre is surrounded by a park that all ages can enjoy. The conference rooms are well equipped with sound system and everything required for great presentations. The main conference room holds up to 100 people. The chairs are fitted with fold-down writing tables. Facilities are air-conditioned. For international conferences, an interpreter-cabin for two is provided. The centre welcomes other denominations as well, from both within and beyond the borders of Hungary. Address: 4934 Beregdaróc, Alkotmány út 5. The Seven Stars Holiday and Conference Centre is situated in Beregdaróc. The centre is in the neighbourhood of a Gothic church, which was built in the fourteenth century. The rooms with a gallery and the separated apartments have a unique industrial design and are furnished with the artwork of well-known industrial artists. The Centre tries to help with the reconstruction of the art relic churches with the income from our activities. Furthermore, they provide employment opportunities for the local population. Address: 3434 Mályi, Gárdonyi G.u.2.sz. The Candlelight Conference Centre is situated on the shore of Lake Mályi, near Miskolc, in the North-East of Hungary. The Centre can host up to 120 people and it has a large conference room suitable for 80. The two small rooms are suitable for a maximum of 25 people. It is a perfect venue to organise professional trainings, conferences and camps. The Centre offers sports facilities and all technical equipment necessary for a conference. Address: 8273 Monoszló, Templom utca 8. The Monoszló Forest School and Conference Centre is located in the old Calvinist primary school building that was recently renovated and extended to meet modern needs. The establishment offers ‘forest-school’ programmes to higher primary school students. Visitors have access to the lecture room of the School, fully equipped with modern audiovisual and IT facilities. The School offers accommodation in fifteen double rooms, all with en suite facilities. The students can learn about nature and forest life in an open-air ‘classroom’ and two nature trails. A modern kitchen and a restaurant are available for the comfort of visitors. The Monoszló Forest School and Conference Centre is also available for adult training and further education programmes. The comfortable rooms, the untouched natural environment make it ideal for hosting small conferences, courses, company training projects, or for family weekends. The establishment also welcomes small national or international church events or conferences. The diverse natural surroundings, the proximity of Lake Balaton, the small vehicle traffic on the roads interconnecting the local villages also make the Forest School an ideal starting point for small groups of hikers or cyclists. Being a very old village, Monoszló has many historic sites and buildings. The Calvinist church, the earliest building in the village whose foundations probably date from around the 10th or 11th century, features a Gothic apse and a restored Romanesque portal. Next door to the church is a historic Calvinist vicarage, built at the time of the Reformation in Hungary. In the churchyard stands a dogwood tree, a real botanical rarity in Hungary. It is known to have been there in the early 19th century. Its bright yellow flowers herald the spring in the cool microclimate of the Monoszló Basin.